For the new year, we've decided to put together group blog posts based on contributions from all of our members. This month we posed the question, "What are your quilting resolutions for 2011?" 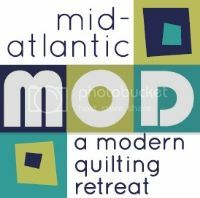 Now that the resolutions have been sorted, it's clear: the Philly Modern Quilt Guild members are all pretty much cut from the same cloth (quilt pun totally intended!). While some of our members have unique aspirations for 2011, by and large, our focus is in on two areas – trying new things and getting our spaces cleaned up/ working through some stash backlog. Something new. While a lot of our members just wanted to try something new in general – learning to piece or quilt by hand and trying new blocks – others got specific. Andrew wants to make a Bargello quilt in the new year and Allison is hoping to try make both a cathedral window and a hexagon quilt. Carol is interested in learning how to dye her own fabric and make an art quilt. Angie resolved to design a pattern tutorial for her blog. We have so many talented people in the group who have a wide array of skills to share. It will be exciting to see if we can help one another tackle some of these endeavors in 2011. Cleaning things up. When it comes to unfinished projects and organizing the space we have available for our craft, guild members are resolving to get things cleaned out. Cathy and Grace, in particular, are making cleaning up their studios a priority. Cathy cites a small space and the need for organization. Grace points to her fabric stash and wants to get it in order so she knows what she has available for new projects. Last but not least are the unfinished projects that have a tendency to hold us back mentally (we've all been there: “I really need to get going on that project. I started it eight years ago. I resolved to finish this last year. I'll get going with it next week for sure ...”) and take up valuable space in our homes and studios. Denise has an ambitious resolution to finish two UFOs for every new quilt she makes. Georgia and Cindy each have specific projects pre-planned for the new year. We know everyone will make headway in 2011. From the Philly Modern Quilt Guild, we wish all of our readers a happy and productive 2011! Nice post Allison! It was fun to particiate - I look forward to more "group posts" during the year! Great job condensing into everyone's resolutions into one concise post! Looking forward to a great 2011! Great post! I like the group questions, and I'm glad I'm not the only one who needs to use up some stash. Definitely 2011 is the year to get more projects done! Would love to hear follow up from Susan on her research for buying the Juki. I got to try one out at an Etsy sewing meet up and they are fabulous. Been thinking about getting one myself.